Does Trying To Repeal Obamacare Actually Increase Its Appeal? On Monday, the Trump administration once again took aim at the Affordable Care Act, this time saying it wants to entirely scrap the health law. This marked a major turning point, as the administration had previously argued that portions of the law should remain intact, including protections for people with preexisting medical conditions. But now President Trump and Justice Department lawyers are asking the courts to uphold a federal judge’s decision from December that found the entire law unconstitutional. If the law is struck down without a plan to replace it, this means millions of people could lose coverage, which would be a political disaster for Trump — especially as more than half of Americans hold a “very” or “somewhat” favorable view of the health law. This is according to the Kaiser Family Foundation, which has tracked the law’s favorability every month since it was first signed into law nearly a decade ago in 2010. As you can see in the chart below1, while the health care law has struggled in popularity over the years, late 2016 marked an inflection point, in which the law inched upward in popularity among the American public (although it has remained largely unpopular among Republicans). “It wasn’t until the repeal-and-replace debate that some of the real benefits of the law became clear to people,” said Mollyann Brodie, a senior vice president at the Kaiser Family Foundation, referring to congressional Republicans’ efforts in 2017 to repeal and replace the law. “Given our experience of what we observed during repeal and replace, I think that it’s certainly the case that when people feel like there is a real threat to this law, there is a real rallying-around-the-law effect.” The March numbers were just released this week, showing an overall net favorability of about +10, but Brodie said they expect to see a bump in favorability if the Trump administration renews its efforts to dismantle the ACA. In fact, since 2016, support for the law has increased significantly across every demographic group KFF tracks with one notable exception — people that identify as Republicans.2 Trump campaigned on repealing Obamacare, so renewed efforts to repeal the law could be a play to his base. Democrats have promised to fight back against the Trump administration’s latest efforts to dismantle Obamacare, and many in the party have begun to set their sights beyond the ACA, working to bring a number of ambitious health care policy proposals into the 2020 arena. And some of these proposals have polled well. For example, KFF found in its March monthly poll that 56 percent of Americans either “strongly” or “somewhat” favor having a national health plan, which the poll described both as “Medicare-for-all” and as a “single government plan,” in which all Americans would get their insurance from the government. But Brodie cautioned that gauging support for Medicare-for-all style health care reforms is tricky. Support tends to be highly partisan and often varies based on how the question is asked and whether respondents are presented with arguments for and against the policies. For example, in a January poll on Medicare-for-all, KFF found a majority of Americans supported the idea, but the net favorability dropped by a whopping 44 percentage points when voters were told the plan could lead to delays for people seeking care. But support increased by 45 percentage points when voters were told it would guarantee health insurance as a right. And some pollsters like Quinnipiac have even found a decline in support for the idea of a single payer health care system. That said, the pollster also asked respondents if they supported keeping the current health care system with an option that gives Americans the ability to buy into Medicare, and they found that 51 percent, including a plurality of Republicans, supported this less radical overhaul. So there is some early evidence that Democrats might be able to woo a general electorate with health care reform in 2020 if they scale back some of their more sweeping health care reform proposals. And if Trump wants Republicans be “the party of healthcare” as he suggested in a tweet this week, he will need to think of a replacement that can compete with whatever Democrats decide to offer — especially as repealing Obamacare could be unpopular. A Morning Consult/Politico poll conducted after special counsel Robert Mueller ended his investigation into Russian interference in the 2016 election found that 47 percent of registered voters still think that Trump tried to “impede or obstruct the investigation,” even though Barr’s summary of Mueller’s report did not make a determination on whether the president obstructed justice. 74 percent of registered voters, including 56 percent of Republicans and 84 percent of Democrats, told YouGov in a poll this week that they think the full contents of Mueller’s report should be made public. A Quinnipiac poll of Democratic primary candidates found Pete Buttigieg tied with Elizabeth Warren in fifth place, both polling at 4 percent. This could signal a big bump for Buttigieg, as he had previously polled at 1 or 2 percent in most national polls, but we’ll have to wait and see how big the Buttigieg bump gets. A poll conducted by the Chicago Council on Global Affairs and the Levada Center asked Americans and Russians whether they thought their governments should cooperate with each other or limit the other country’s influence. In both countries, over half of respondents preferred policies that limited the influence of the other country. This is similar to what the poll found in 2017, but marks a reversal from 2016 when 56 percent of Americans preferred to cooperate with Russia. Half of registered voters say that presidential elections should be determined by the national popular vote, while 34 percent say they should be determined by the Electoral College, according to another Morning Consult poll. Seventy-two percent of Democrats thought the national popular vote should decide elections compared to just 30 percent of Republicans, whereas 57 percent of Republicans preferred the Electoral College compared to 16 percent of Democrats. Almost half of Americans think the college admissions process is rigged, according to a Fox News poll, while only a quarter think it is fair. 36 percent of voters, including 63 percent of Republicans and 19 percent of Democrats, said in a Huffpost/YouGov poll that there is a lot of discrimination against white people. According to FiveThirtyEight’s presidential approval tracker, 41.9 percent of Americans approve of the job Trump is doing as president, while 52.8 percent disapprove (a net approval rating of -10.9 points). At this time last week, 41.6 percent approved and 53.1 percent disapproved (for a net approval rating of -11.5 points). 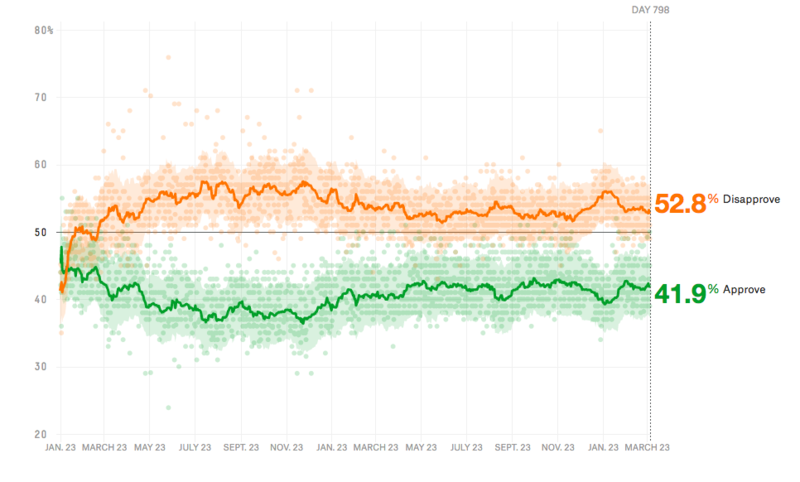 One month ago, Trump had an approval rating of 42.3 percent and a disapproval rating of 53.3 percent, for a net approval rating of -11 points. To smooth out fluctuations from month to month, we used a three-poll rolling average of net favorability. Polls were conducted monthly with a few exceptions. 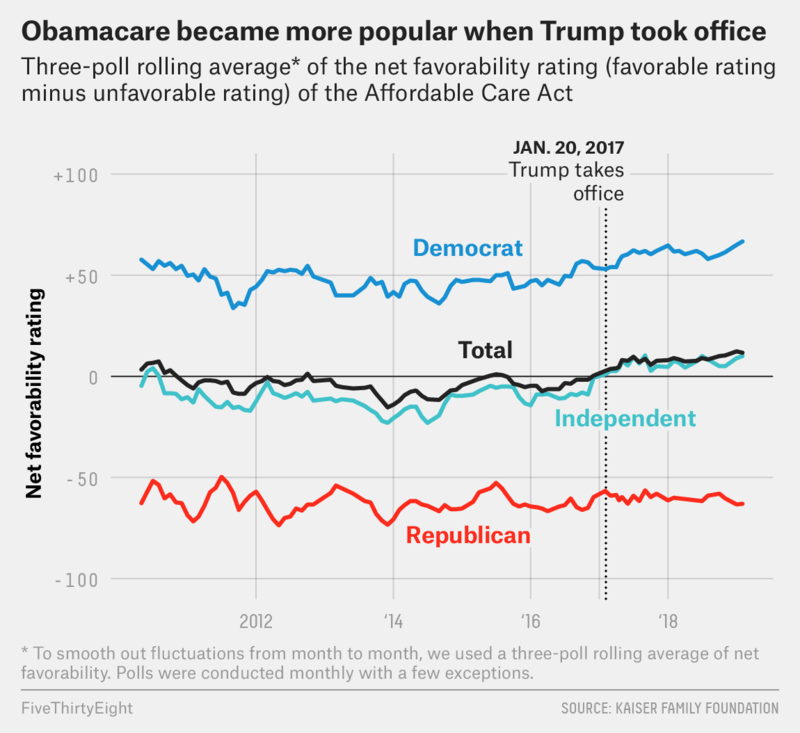 To better understand how Obamacare’s favorability changed from 2016 to 2019, we took an average of the net favorability rating across every demographic for all the polls in 2016 and compared that to an average net favorability across every demographic in all of the polls that we have for 2019 so far.